In brief: Our expectations were fairly low to begin with, but the lunch boxes turned out even a notch below that. 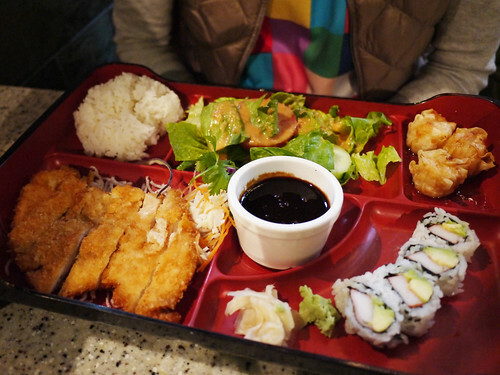 When the "entree" portion of a lunch bento box disappoints, there is not much to save the meal. Everything else, the California roll, shumai and salad, was pretty much as you would expect at a place that bills itself as "Japanese and Thai" but is actually a front for sub-par sushi. This is not to say that Mizu doesn't have a bustling lunch service, they do. The tables were filled, take-out orders went out all afternoon. It's just not for us, but we had guessed it wouldn't be.